Sumo Lounge asked me to review another of their products, but this time, they let me choose what I wanted to review. Being me, I immediately started measuring to see what I actually had room for. Upon learning that I did NOT have room for the Sumo Maximus, I decided I wanted to review the Sway Single. The Sway Single weighs 36 lbs and measures 43"X 39" L X 31" H. I boldly copy/pasted that data from their website because, well, it’s important information, and because the package it arrived in was significantly smaller. I’m assuming the chair was vacuum sealed, because it started out shaped sort of like a weird egg, and took some time to expand into an actual chair-like shape. 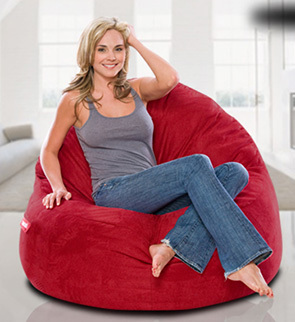 Once I sat in the chair, I learned an important fact: The model pictured on their website must be MUCH lighter than me. I sunk right into that chair. Given the lack of density proven in delivery (and the fact that I’m 5’10” and a heavy guy), I probably should’ve expected this. I didn’t, however, and initially, I was disappointed how low I was on the floor. The keyword there is “initially”, because after getting used to it, I found the chair ridiculously comfortable. It’s become my preferred object to sink into while playing video games, watching shows, and reading. It’s not exactly what I expected, but I’m very happy with it. Something else I like is that there’s a pocked on the right side of it, but it could be better. The pocket isn’t small, but it doesn’t have a lot of give, either. There’s plenty you can put in there, but it’s a tight fit even for just my universal remote, and I would have loved a pocket that could fit more in it. It’s a nice feature, but it could stand to be nicer. that you will wind up low to the ground, so depending on how high up your TV is (or whatever you might want to point it at) and how much room you have, it could be an issue. I’m happy with my setup, but it’s something to consider. That said, it is only 36 lbs, so it’s relatively easy to move around for its size. My Sway Single gets moved as needed. The other thing to consider is that there’s also the Sway Couple, which I have not tried, but appears to be just a bigger version of what I have that can presumably fit two people. Given the previously mentioned sinking, it might get a bit snug with two people, but maybe you want that I dunno it’s something to think about maybe perhaps? Too long, didn’t read? I like it a lot. There’s stuff I can nitpick and critique (Dan wants big pockets), but the bottom line is that it’s comfortable, and I favor it over all my other furniture options these days when I want to relax.